Hard boil the eggs for approx. 10 mins, rinse in cold water, leave to cool. Brush the herbs with a little egg white on one side and carefully stick them to the eggs. Pull the tights over the decorated side as tightly as possible and tie firmly on the other side of the egg using the string. Pour the blueberry juice into a deep bowl. Add the eggs in batches and leave to soak for 5 to 30 mins. depending on the colour intensity desired. Remove the eggs and rinse under running water. Cut open the tights, remove the eggs carefully and peel off the herbs, pat the eggs dry. The juice can be reused several times. 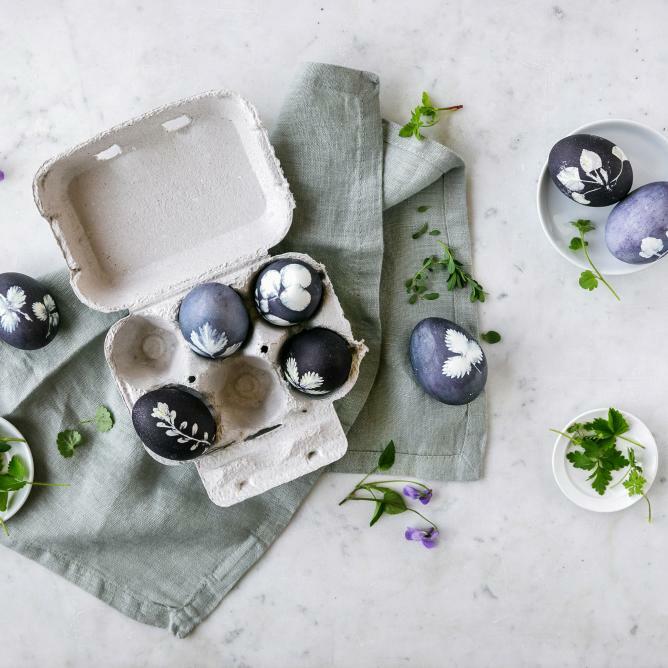 - After dyeing, rub the eggs with a little oil for an attractive polished effect.